Apple Butter Cake with Cream Cheese Frosting - Let the Baking Begin! 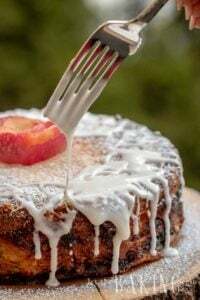 Apple Butter Cake – Absolutely light and delicious sponge cake, filled with apple butter and cream cheese frosting. 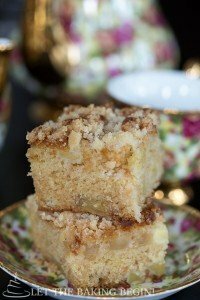 Great Fall Apple Recipe to make when you have a ton of apples. Light and delicious Apple Butter Cake, especially perfect if you have a ton of apples that are not being eaten fresh. The cake layers are soaked with apple juice and layered with smooth apple butter and fluffy cream cheese frosting. With apples being in season, supermarkets and farmer’s markets are filled with different varieties of apples. Sometimes I overestimate our ability to eat the aforementioned apples and I am left with apples that are still totally good but nobody wants to eat them. That’s when I usually make some kind of Apple Dessert. When the apples are cooking the house is filled with such an amazing aroma of sweet, pungent smell of apples which reminds everyone once again that summer is over and fall is in full swing. My husband will usually come and steal a couple tastes of caramelized apple goodness before they’re even done. Knowing this, I make sure to make a little extra. It never hurts to keep a small jar of Apple Butter in the fridge, you know. Morning toast can be made all that much better with a little spread of the golden goodness. Anyway, back to the Apple Butter Cake. I like making the cake rectangular since that means I can bake the cake layer all at once and then just cut it into 2, creating two layers to the cake. If you wanted though, you can bake it in two 10 inch round cake pans and then layer it all the same as you would a rectangular cake. Also, make sure to leave the cake in the fridge overnight before enjoying it. When you just assemble it, the cake layers might look dry. 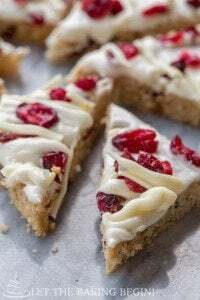 The overnight chill in the fridge will allow the cake layers to become soft and moist from the Apple Butter, the apple juice and the cream cheese frosting. 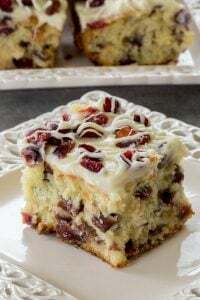 The harmony of flavors in this cake is really nice, I hope you give it a try! Combine the apples, sugar and lemon juice in saucepan and bring to boil. Cook on medium heat for about 30 minutes, stirring often until almost all moisture has evaporated, the apples are translucent and mash easily. Pass cooked apples through a sieve or puree them with a handheld immersion blender until smooth. Add vanilla extract and stir until fully incorporated. Cover and allow to come to room temperature; set aside. In a mixer, whip the eggs for about 4 minutes on high, then without stopping the mixer start to slowly pour in the sugar. Whip for another 6-7 minutes on high. Fold the dry ingredients into the whipped eggs in thirds, folding carefully to not deflate the batter until no streaks of flour are seen. Add room temperature melted butter and fold again until incorporated. Pour the batter into 16″ x 11″ parchment lined baking sheet. Even it out with a spatula. Sprinkle with the mini chocolate chips. Bake in a preheated to 350F oven for about 20 minutes or until a toothpick inserted in the middle comes out clean. Remove from oven, transfer the parchment paper with the cake to a cooling rack. 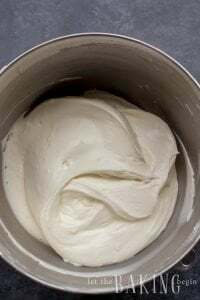 In a bowl, whisk together cream cheese and sugar, stopping to scrape down the bottom of the bowl several times, on high until cream cheese is smooth and lump free, about 3 minutes. Add the heavy whipping cream, vanilla extract, and lemon juice, then continue whipping until the cream is fluffy and increased in volume. Take care not to overwhip or the frosting will separate and become grainy. (if it does start to look grainy add heavy whipping cream one tablespoon at a time and continue whisking until the frosting is smooth again). Refrigerate until ready to use. Measure out where the middle of the cake is and cut the cake in two, this will give you 2 halves that will become 2 layers of the cake. Peel the cake off parchment paper. Put a dab of frosting onto a serving platter. Place 1 half of the cake and press to adhere. Drizzle or brush on half of the apple juice mixture onto the cake. Top with the apple butter and spread around until even layer forms. Top with the second cake layer. Brush on or drizzle the remaining apple juice mixture. Add the Cream Cheese Frosting and even it out. Refrigerate overnight. Trim down all 4 sides of the cake with a sharp thin knife, revealing the layers of the cake. Pour hot heavy cream over chocolate chips. Let sit for 2 minutes. Stir until smooth. Add chocolate to a ziplock bag and snip the end. Drizzle the chocolate in a zig-zag pattern over the cake, then repeat in the opposite direction. Cut the cake into 16 pieces by making 4 even strips down the long side of the cake, then cutting in the opposite directions into 3 even strips. This will give you 16 pieces. Refrigerate the cake until ready to serve. Quick Apple Cake – Soft cake with shredded apples. Apple Rhubarb – Meringue pirog with apples. Combine the apples, sugar and lemon juice in sauce pan and bring to boil. Pour the batter into 16" x 11" parchment lined baking sheet. Even it out with a spatula. Sprinkle with the mini chocolate chips. Bake in a preheated to 350F oven for about 20 minutes or until a toothpick inserted in the middle comes out clean. Remove from oven, transfer the parchment paper with the cake to a cooling rack. Add the heavy whipping cream, vanilla extract and lemon juice, then continue whipping until the cream is fluffy and increased in volume. Take care not to overwhip or the frosting will separate and become grainy. (if it does start to look grainy add heavy whipping cream one tablespoon at a time and continue whisking until the frosting is smooth again). Refrigerate until ready to use. Put a dab of frosting onto a serving platter. Place 1 half of the cake and press to adhere. Drizzle or brush on half of the apple juice mixture onto the cake. Top with the apple butter and spread around until even layer forms. Top with the second cake layer. Brush on or drizzle the remaining apple juice mixture. Add the Cream Cheese Frosting and even it out. Refrigerate overnight. Trim down all 4 sides of the cake with a sharp thin knife, revealing the layers of the cake. by making 4 even strips down the long side of the cake, then cutting in the opposite directions into 3 even strips. This will give you 16 pieces. Refrigerate the cake until ready to serve. oh my! you are my hero 🙂 i have so many apples that are rotting because no one will eat them. and yesterday i was searching for a perfect cake with apples. will try tonight.thanks!! Oh this cake looks INCREDIBLE, Marina!! Absolutely perfect with your cup of tea in the fall or any other season! Love cakes with multiple layers like this one, so European and no doubt delicious!